The submission deadline for additional Poster presentations has closed. Several area business have offered discounts to conference attendees who use their discount cards while in Bemidji. Attendees will receive the card at the time you pick up your name badge from the registration desk. Please visit these businesses during your visit to Bemidji and take advantage of the great discounts they are offering. Kick back, relax and enjoy some networking, refreshments, and appetizers at Bemidji Brewery and Taproom located at 211 America Ave NW in downtown Bemidji from 7-9:30pm. Tours of their craft brewery production will also be given. They have a variety of beer selections as well as non-alcoholic beverages to choose from. Whether you’re just arriving to Bemidji or after a long day of workshops, stop by the Geolounge on the second floor of the Sanford Center for some light refreshments from 4:30pm – 5:30pm. Join us later for a welcome reception being held at the Hampton Inn’s Ballroom located at 1019 Paul Bunyan Dr S in Bemidji from 7:00 – 9:00pm for more networking and socializing opportunities. Afterwards, hop on one of the complimentary shuttles to Conference Social at the Bemidji Eagles Club located at 1270 Neilson Ave SE from 7:15 - 9:30 p.m. There will be games, raffle prizes, and more to benefit the MN GIS/LIS Scholarship Fund. Visit the *official* conference map. View the conference schedule, check out workshop and session offerings at the Sanford Center, check out places to visit while in Bemidji, and much more! The map is also mobile friendly - check it out on your phone or tablet device! We will meet up at the entrance of the Sanford Center at around 6:10 a.m. Fun Run/Walk will begin at 6:15 a.m. 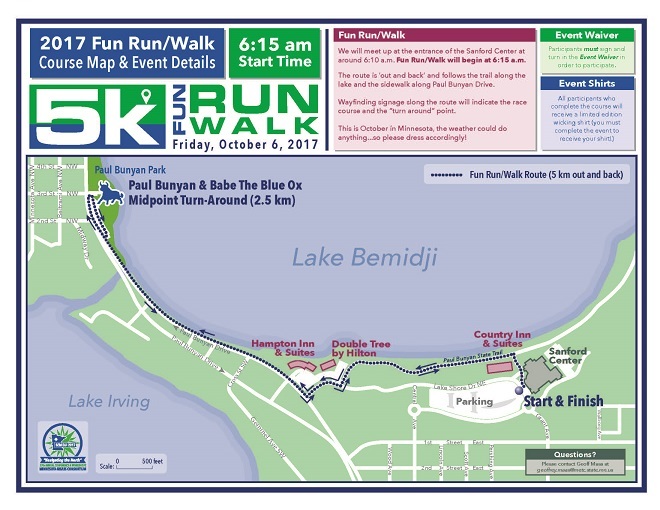 The route is ‘out and back’ and follows the trail along the lake and the sidewalk along Paul Bunyan Drive. Wayfinding signage slong the route will indicate the race course and the “turn around” point. This is October in Minnesota, the weather could do anything...so please dress accordingly! The Student Assistant Program is back and seeking full time students interested in GIS to assist us at our annual conference in Bemidji this October. Accepted student assistants will receive registration, hotel accommodations (shared with other students), an experienced mentor, and much more! Applications must be submitted by Friday, July 14th; learn more about the program and apply today!